Can you taste it? Warm weather is on the way, and with it comes cravings for fresh, bright colors and flavors. 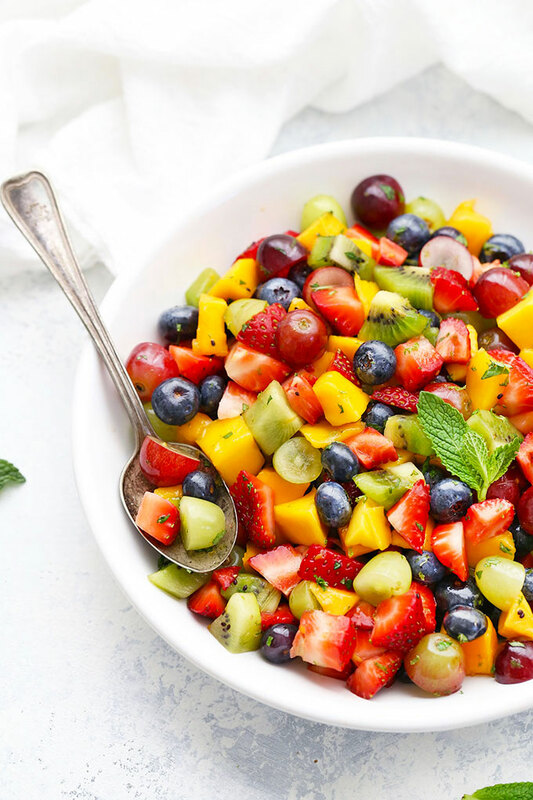 With Easter just around the corner, followed by spring baby showers, and summer potlucks, parties, and cookouts, this rainbow fruit salad with citrus mint dressing couldn’t have come at a better time! 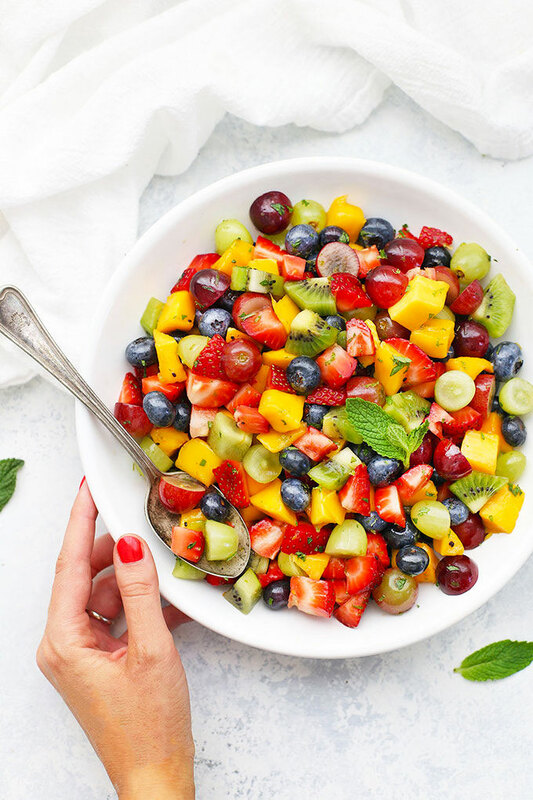 Not only does it come with big, bold, beautiful colors, my rainbow fruit salad is drizzled in a fresh, bright citrus mint dressing you won’t be able to resist. 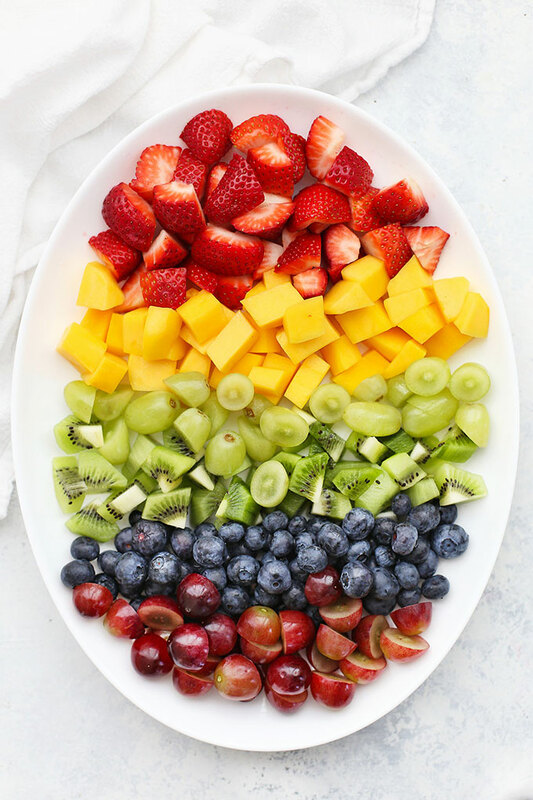 Eating the rainbow has never tasted so good! STRAWBERRIES (RED) – They’re SO good in fruit salad. That vibrant red color and perfectly sweet flavor is the perfect base. 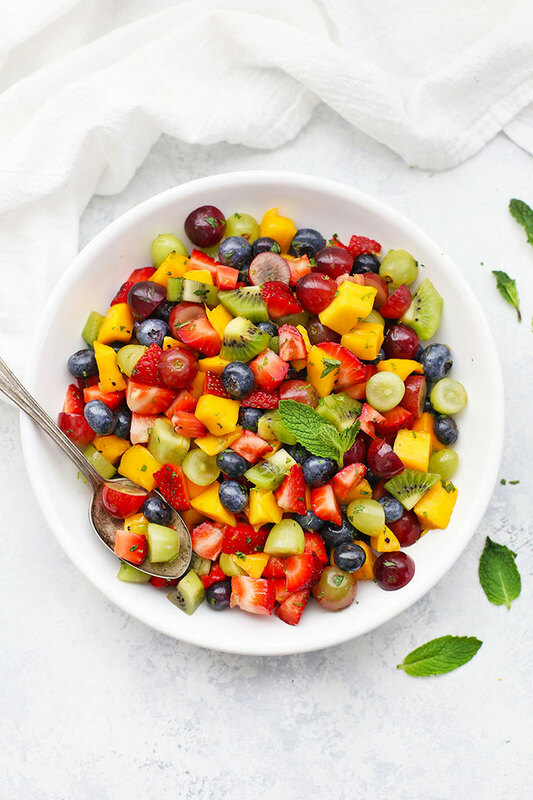 MANGO (ORANGE) – I’ve tossed mango into my honey lime fruit salad recipe several times and always love the flavor and color boost. I knew it would be perfect here! KIWI & GREEN GRAPES (GREEN) – Kiwi is SO good with berries and mango! Plus, the color is so cheerful and happy. I also love using a mix of green and purple grapes (see below) because it’s a nice balance of tart and sweet, and the colors are just lovely! BLUEBERRIES (BLUE) – They hold up beautifully with the citrus dressing and pair so nicely with strawberries and green grapes. It’s one of the only ways my kids love fresh blueberries! PURPLE GRAPES (PURPLE) – As I mentioned above, we love a mix of purple and green grapes. Green are a bit more tart, while purple tend to run on the sweet side. If you want, you can use all of one or the other, but we love a mix for the color and flavor balance. So pretty! PS – Want more rainbow ideas? Check out the FAQ below! 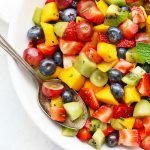 ORANGE JUICE – Orange and mango is one of my favorite flavor combinations, so it really brightens up the flavor even more and gives it a different feel than my other fruit salads. HONEY OR AGAVE – Perfect for a little sweetness to balance out the tart citrus. Depending on how sweet your orange juice is and how sweet your fruit is, you may decide you need a little more or less. Feel free to start small, taste, and add more as needed. Most of the time, I like about 1 Tbsp for the whole recipe. A LITTLE FRESH MINT – I don’t tend to love mint in my recipes, but it does MAGIC things in fruit salad. It doesn’t make this salad taste minty to me. Instead, it’s just bright, fresh flavor that wakes up the fruit. So nice! That said, if you really hate it, or have kids that won’t tolerate it, feel free to leave it out. I find I don’t love bananas in fruit salad (the texture just doesn’t hold up and it overpowers the salad), but if you like it, it’s another great yellow or white to add to the equation. VEGAN? READ THIS! Most of my citrus fruit salad dressings use honey, but agave syrup or apple “honey” are fantastic vegan options you can easily substitute here. I love them just as much. CAN I MAKE THIS IN ADVANCE? Yes, BUT I don’t recommend making it hours and hours ahead of time. The citrus juice and natural sugars in the dressing break down the walls of the fruit over time, so the longer this sits, the softer all the fruit gets. 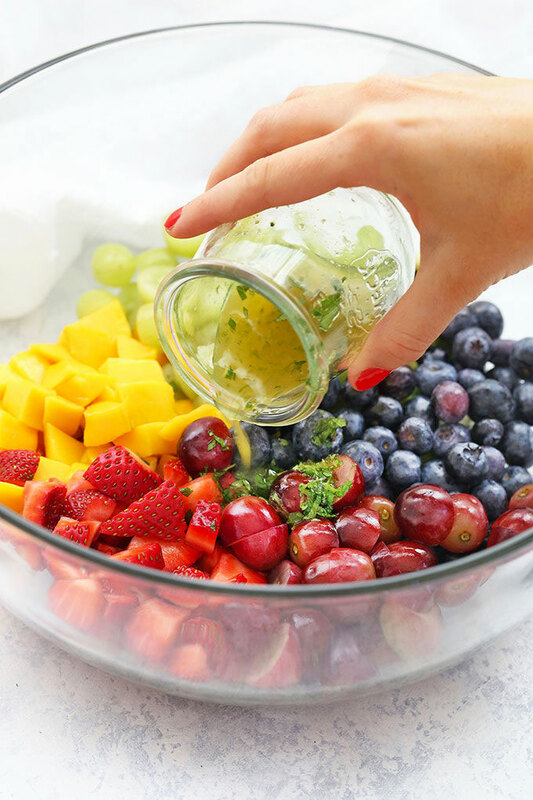 You can get away with 1-2 hours ahead of time, but I typically mix up the fruit and the dressing and keep them separate until a few minutes before serving for the best texture. HOW LONG WILL LEFTOVERS KEEP? Again, because of the dressing, it’ll continue to soften, so it’s best eaten in 2-3 days. 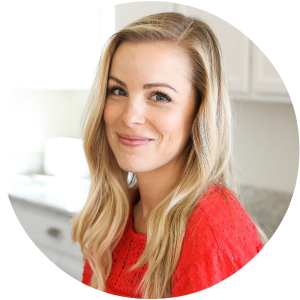 I’ll often blend leftovers the next morning with some ice to make a smoothie (SO GOOD) or I’ll pour the puree into popsicle molds for incredible fruit popsicles (we LOVE these!). Drizzle with citrus mint dressing (recipe below) and stir to coat. 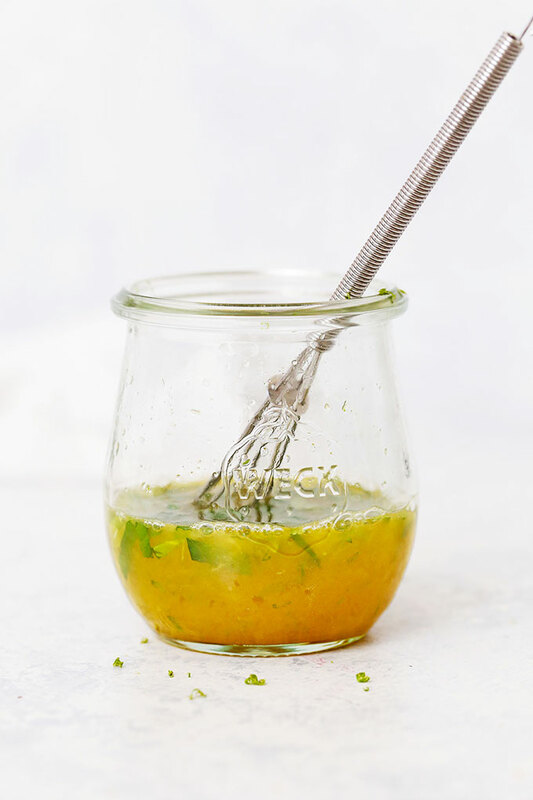 In a small jar or bowl, whisk together lime zest, lime juice, orange juice, honey, and mint. Stir until well combined. 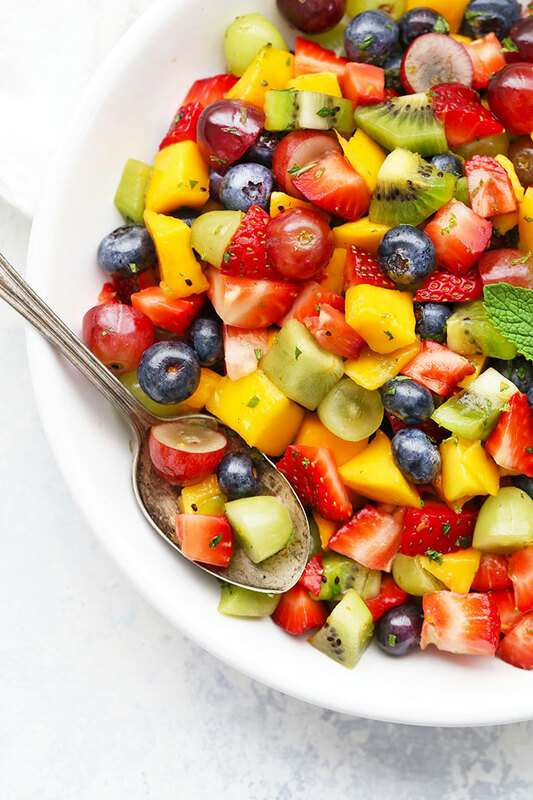 Pour over your rainbow fruit salad immediately, or store covered in the refrigerator until ready to drizzle over salad. Dressing can be made ahead of time (several hours, up to 1 day) and stored in the refrigerator until ready to serve. Note: the flavors will develop and strengthen with time. 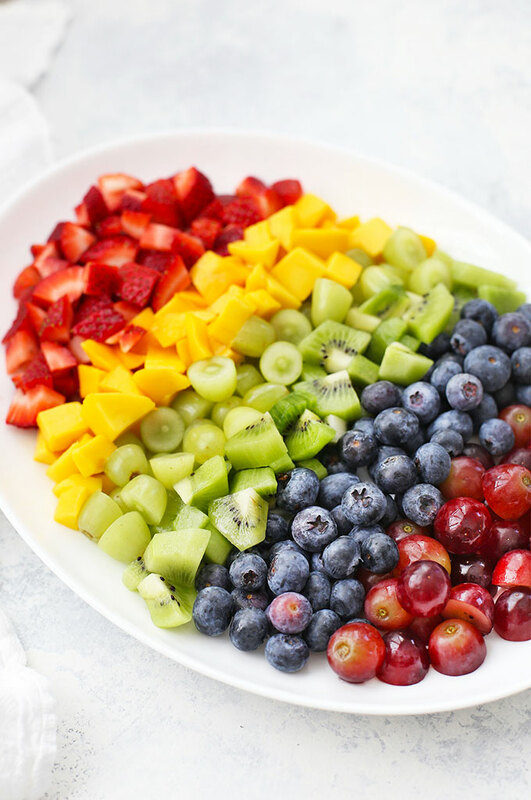 *Alternatively, you can serve them unmixed in rows on a platter in rainbow order–Strawberries, mango, green grapes, kiwi, blueberries, purple grapes. Then, drizzle or spoon the dressing over everything without mixing.